Are you a real The CW Fan? Prove it! Enter The CW Fan Sweepstakes at CWTV.com/Sweepstakes and you could win a Premium Entertainment Package valued at $500. 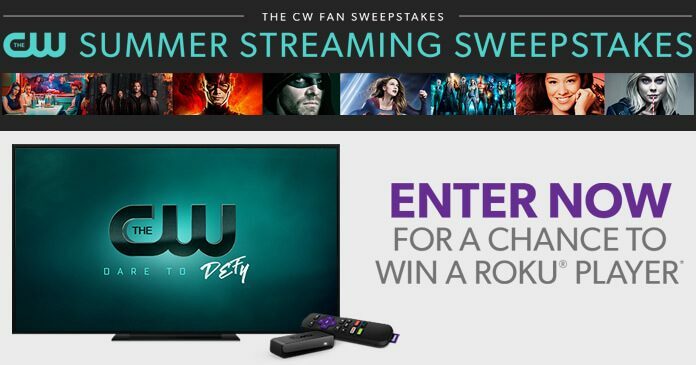 Plus, enter The CW Summer Streaming Sweepstakes during the month of July and you could win a Roku player. A new prize every month through December 30, 2017. The Sweepstakes will consist of the Master Sweepstakes Period, and within the Master Sweepstakes Period there will be 6 Mini Sweepstakes Period, as detailed in the chart below. Access the Sweepstakes, visit www.cwtv.com/sweepstakes to reach the Sweepstakes registration page and follow the on-screen instructions to provide the following information: your first name, last name, email address, and any other Entry-related personally identifying information requested by the Sponsor. One Grand Prize will be awarded to the verified Grand Prize Winner. Prize will consist of one (1) Premium Entertainment Package. Approximate Retail Value of the Grand Prize is $500. Mini Sweepstakes Period–specific Prizes will be disclosed on the Website at the beginning of each respective Mini Sweepstakes Period. Want to know more about The CW Fan Sweepstakes? Check out the details below. The Sweepstakes is open to individuals who are at least 18 years of age and the Age of Majority on the date of entry, and are a legal resident of and physically residing in one of the 50 United States or the District of Columbia (excluding Puerto Rico, Guam, American Samoa, United States territories, possessions and protectorates, foreign-based United States military installations and wherever restricted or prohibited by law). The entry period begins on July 12, 2017, at 12:00:01 a.m. PT and ends on December 30, 2017, at 11:59:59 p.m. PT. You may enter the Sweepstakes one time during each of the Mini Sweepstakes Periods for a total of 6 times during the entire Master Sweepstakes Period. On or about January 15, 2018, one potential Grand Prize Winner will be selected in a random drawing by the Administering Agency from all eligible Entries received during the Master Sweepstakes Period. On or about 7 days after the end of the respective Mini Sweepstakes Period, a Prize winner or Prize winners will be selected in random drawings by representatives of the Sponsor from all eligible Entries received during the respective Sweepstakes Period. For the names of the Prizewinners, available after January 30, 2018, send a self-addressed, stamped envelope, to be received by February 28, 2018, to The CW Fan Sweepstakes 2017 Winners List Request, 8545 W. Warm Springs Road, #A4-321, Las Vegas, NV 89113. The Sweepstakes is sponsored by The CW Network, LLC, located at 4000 Warner Blvd., Burbank, CA 91505 and is being administrated by EnterGrate, Inc., 8545 W. Warm Springs Road, Las Vegas, NV 89113. For complete details about this CW Sweepstakes, please read the official rules.